Moammar Gaddafi pledged to crush dissent in his country; and ruthless he was as the Libyan leader's mercenaries walked through the streets of Tripoli gunning down every voice they heard against their boss. Global condemnation? 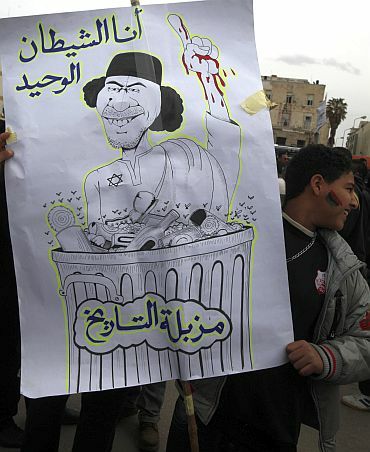 Bah Gaddafi doesn't care -- he is defiantly acting tough to save his 41-year rule. While official figures put the toll at 300, a lot more blood has been shed in Tripoli. Italian Foreign Minister Franco Frattini, quoting 'credible sources, claimed that the crackdown has killed as many as 1,000 people. In a long speech made in Tripoli, Gaddafi refused to relent to the demonstrators who want an end to his 41-year-old reign. "I will fight to the last drop of my blood," he said. During the 75-minute speech, the Libyan leader threatened death sentences against anyone who challenged his authority and declared that he had more justification to use force that the Chinese authorities who ordered the massacre in Tiananmen Square. A Libyan air force major confirmed the presence of African mercenaries, fighting on behalf of Gaddafi. Major Rajib Feytouni was quoted by a media agency as stating that he had personally witnessed 4,000-5,000 mercenaries being flown into his air force base on Libyan military transport planes, beginning on about 14 February -- several days before the uprising started. 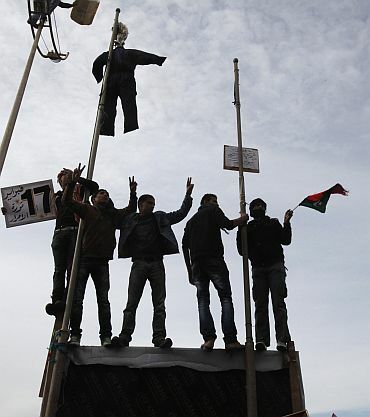 With much of the east said to be under their control, the protesters claimed new gains in cities and towns closer to the heart of Gaddafi's regime in the capital. Protesters said they had taken over Misrata, which could be the largest city in the western half of the oil-rich north African country. "I announce my resignation from all my duties in response to the revolution of February 17 (against Gaddafi)," Yunes, attired in a military uniform, said on the pan-Arabic satellite channel Al-Jazeera. Gen Yunes, who followed in the steps of Justice Minister Mustapha Abdeljalil, called on the armed forces to join the revolt and respond to the legitimate demands of the people. Reports said that Youssef Sawani, a senior aide to Saif al-Islam Gaddafi, one of Gaddafi's influential sons, also resigned from his post in protest against the violence. 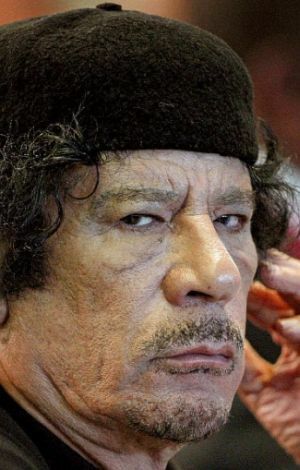 The resignations came a day after Abdeljalil quit in protest over the "excessive use of violence" against protesters, and diplomats at Libya's mission to the United Nations called on the army to help remove "the tyrant Muammar Gaddafi". 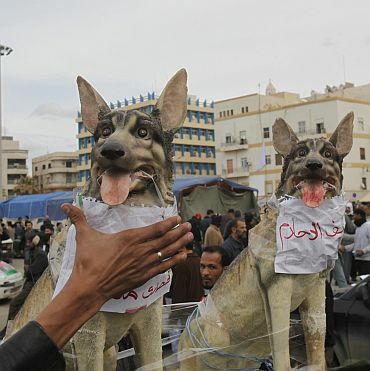 Two air force pilots jumped from parachutes from their Russian-made Sukhoi fighter jet and let it crash, rather than carry out orders to bomb Libya's second largest city Benghazi, which is now under the control of protesters. People let off firecrackers and honked their horns to mark the end of days of bloodshed in Benghazi. TV footage showed an empty jail burnt in Benghazi and Sky News showed visuals of anti-aircraft missiles at what it said was an abandoned military base near the eastern city of Tobruk. 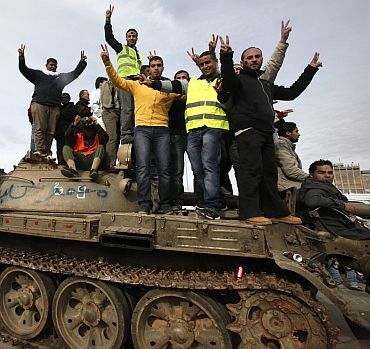 Gadaffi has deployed troops to the west of Tripoli to try to stop a revolt that started in the east from spreading. 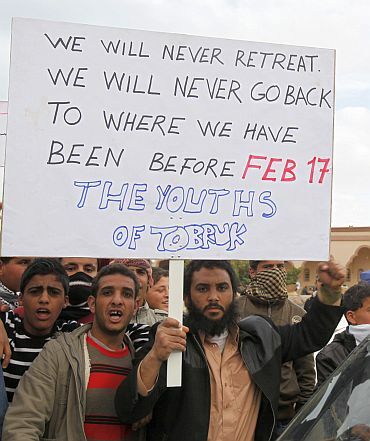 In the east, many soldiers have withdrawn from active service and deserted the military base near Tobruk. 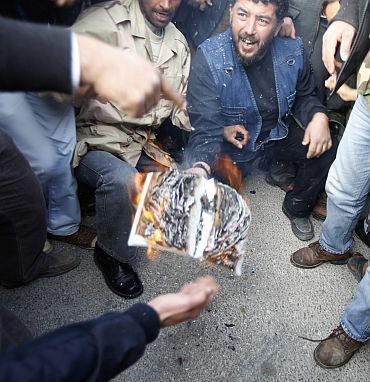 Libyan diplomats in several countries have either resigned in protest over the use of force, including the alleged firing by warplanes on civilian targets, or renounced Gaddafi's leadership, saying they stood with the protesters. The Libyan Interior Ministry gave the first official death toll since the uprising began a week ago, saying 300 people had died so far -- 189 civilians and 111 soldiers. Unofficial figures paint an entirely different picture. As countries across the world started evacuating their nationals trapped in Libya, India and 14 other members of the powerful UN Security Council strongly condemned the use of force against the peaceful protesters. Observers, however, are calling for stronger action on part of the UN such as establishing no-fly zones, imposing sanctions and setting up a humanitarian corridor. "The specific measures, like no-fly zones and some other specific sanctions, including specific measures, like sanctions, are the ones which the Security Council needs to determine," UN Secretary-General Ban Ki-moon said. 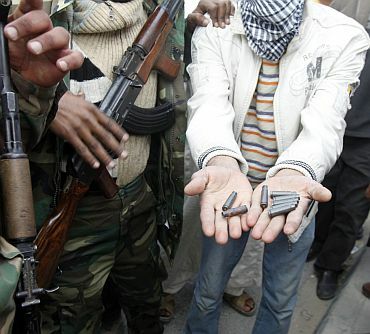 The Arab League also issued a statement, banning Libya from attending meetings until it stopped attacking its citizens. Ban also welcomed the decision by the Geneva-based UN Human Rights Council to meet in a special session on Friday with the possibility of setting up an international investigation into the recent events in Libya. According to a Los Angeles Times report quoting analysts, Gaddafi's traditional backing from powerful tribal leaders also is starting to unravel, marking a potential turning point. Key among them is the Warfallah tribe, one of Libya's largest, which is based south of Tripoli. It announced it was joining the movement to oust him. Residents of Tripoli said the government sent out cell phone text messages urging people to go back to work, insisting life was returning to normal. But protesters reportedly also used texts to urge police, members of the army and others to march on Friday. "We don't know who is in charge," Najah Kablan, a teacher, said by telephone. "It is very frightening." 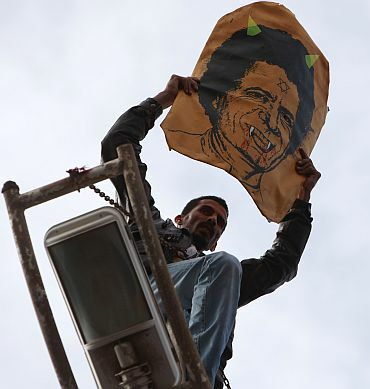 Regardless of the eroding power establishment, Gaddafi is adamant on crushing dissent. 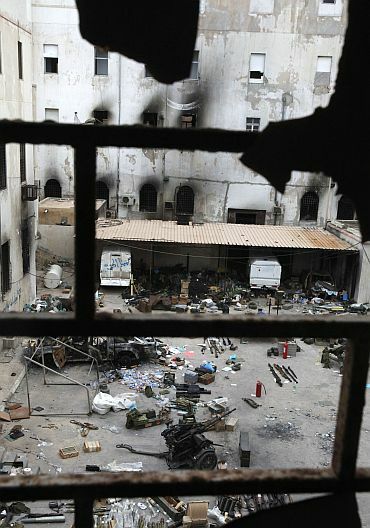 Libya's defence ministry, in a statement, said that the violence that had rocked the country in the last few days was the work of gangs of delinquent youths manipulated by foreign forces, including Al Qaeda. "With regard to this phenomenon that is terrorizing citizens, halting commerce, frightening merchants and consumers, and threatens to cut civilian services such as health and education, some youths and adults obtained weapons by robbing army storehouses," the statement read out on Libyan state TV said.